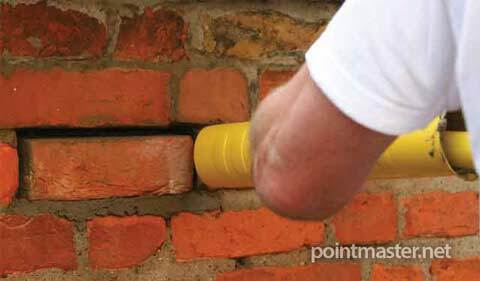 For regular brickwork, 10 square metres an hour is easily achievable. Standard Tool £23.90. Professional Pack £35 (Incl. UK delivery). Same Day Despatch when you order before 4pm. 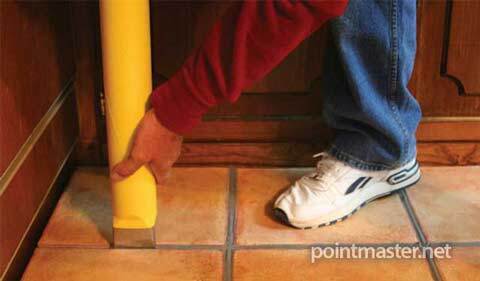 The Point Master is a fast & efficient device for applying most types of mortar & floor tile grout directly to the joint. The nozzle is made from hard wearing stainless steel & will tolerate limited adjustment to suit different joint widths. Thorough mixing is essential & is best achieved with a cement mixer. However, vigorous hand mixing can achieve equally good results. The Point Master is suitable for most sands, including medium sharp sand mixes. However, very gritty sands may not be suitable. Avoid using Monofilament sand, as this has no fine particles (for example kiln dried paver sand). Be aware of using wet sand - you may not need to add as much water as you think (See "Common Mistakes" Below). Best results are obtained by using a relatively soft sand & a good quality plasticiser. Mix the sand & cement together in a cement mixer or suitable mixing vessel such as a barrow or bucket. Add water in gradual stages, mixing thoroughly each time. Important: Do not add the full amount of water until your mixing is nearly complete - (Add only 80-90%). mixing thoroughly BEFORE the full amount of water is added will allow the plasticiser to add tiny air bubbles to the mortar. After thorough mixing, add more water until the correct consistency is achieved. Carry out a quick test with the Point Master. You will soon become familiar with the consistency required for easy use. 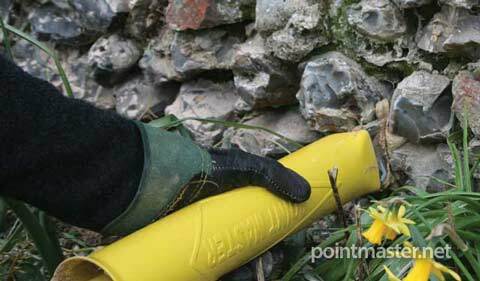 The use of plasticiser in mortar is standard practice & not a special requirement of the Point Master. 1. 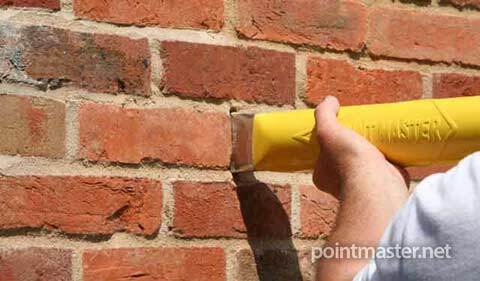 If necessary, adjust the nozzle* to fit inside the mortar joint. 2. ‘Liven up’ the mortar. A quick stir is usually sufficient. 3. Don’t completely fill the Point Master until you are familiar with using it. 4. Hold the Point Master just behind the nozzle, place your other hand on the ‘end’ of the handle grip. Keep the Point Master out to one side of you (not in front of you). 5. A slight twisting action of the handle whilst applying pressure will help to encourage an even flow. 6. Before each refilling, shake or gently tap out unused mixture. 7. Fill the Point Master & use immediately, holding the nozzle square to the joint (see images 1 and 2 below). 8. Slightly overfill the joints using a series of movements along the joint, or with a continuous sliding motion. 9. Wash out periodically. Clean the tool thoroughly after use. * To adjust the nozzle (on the tool), use pliers on each side of the nozzle only. Straighten the long sides if they have bowed inwards. For specific jobs, the short sides of the nozzle can be customised, see image 3 below. 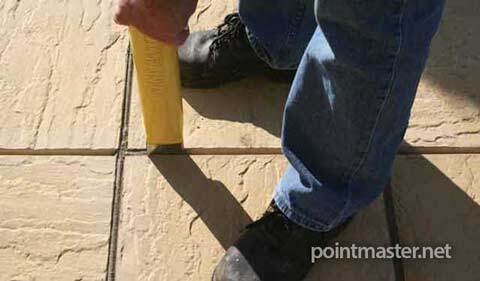 Old joints should be raked back to at least 15-20mm, or deeper for paving, then brushed or washed thoroughly to remove any dust. 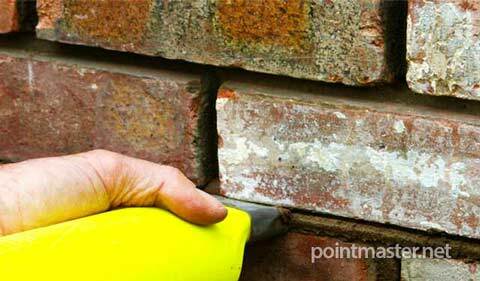 A power washer will often remove lime mortar from brickwork or dry mixed mortar from patio joints. 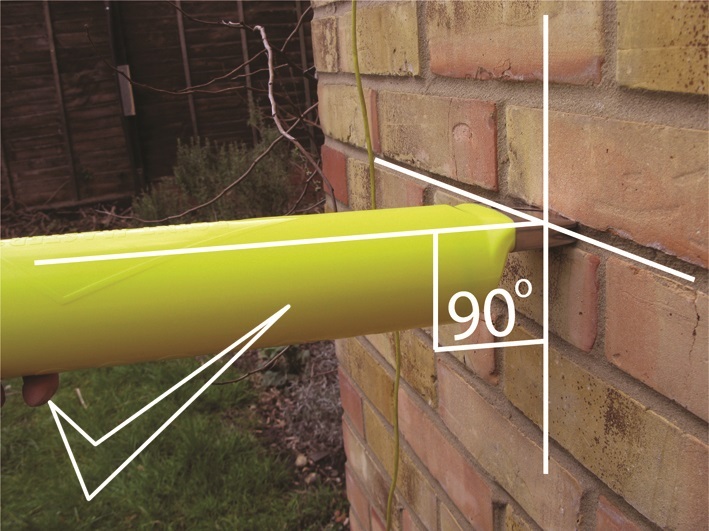 For wall pointing, fill the bed joint first and then fill the perpendicular (upright) joints above it. This stops sagging. 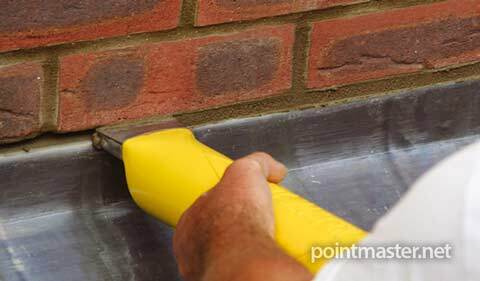 After applying new mortar, leave the unfinished pointing to stiffen slightly, finish the joint by smoothing off with a trowel or pointing iron. Lightly brush over before the mortar has set hard. Do not use old cement that has become ‘lumpy’. Avoid mixing too much mortar, especially in hot weather. Freshly mixed mortar is more effectively applied than that which has partly cured. Different sands & mixes will flow differently, therefore it is important to find the right consistency. Standard mix for wall pointing: 5 parts building sand, 1 part cement, add plasticiser to manufacturers instructions. Use maximum amount when mixing by hand. Patio slabs or exposed brickwork, you may need a stronger mix. For example - 3:1 sand / cement. A good quality liquid plasticiser is required. Add this directly into the mix, not into the water. For non structural applications, washing-up liquid could be used as a substitute for commercial plasticiser. An approximate measure would be one third (1/3) of a teaspoon of concentrated liquid for 5 shovels of sand and cement mix. Bagged pre-mixed mortar may require a small amount of additional plasticiser, especially when mixing by hand. Thorough mixing is still required as this will add air and make the mortar easier to use. Lime Mortar (typically) 2.5 sand / 1 lime: Plasticiser is not required, but the mixing time should be longer. The mix should be allowed to sit for a period after initial mixing, to allow it to self-bulk - then remix and use. Adding too much water in the early stages of the mixing process is a common mistake. This will stop the plasticiser from working properly and will result in a flat mix that does not flow correctly. It may also cause the water to separate. If this happens, add more sand, cement & plasticiser to dry the mix, mix thoroughly in this drier state for several minutes, then add water to achieve the correct consistency. The rubber piston washer is not designed as a seal and so does not make a tight fit. This part will require replacing when it no longer protrudes from the side edge of the plunger. Slide a thin bladed screwdriver halfway down the side of the washer, pull the washer up so that you can stretch it off. Stretch a new washer over & into the groove (the end cap is non removable). The Point Master stainless steel nozzles & piston washers are both replaceable items. You can order these by calling us on: +44 (0) 208 133 5396 or on 0845 116 0284*. Or simply use our online shop. The edges of the Point Master’s nozzle may become sharp with use, so care should be taken to avoid these sharp edges. In this respect, protective gloves are recommended. In accordance with standard building regulations, Personal Protective Equipment (PPE) should be used. What applications can I use it for? It is suitable for most applications using regular cement mortar, lime mortar and grout for flooring. It works with most common mix ratios, and is fine with mortar colourant. Copyright © 2006 - 2019 Point Master (uk) Ltd. All rights reserved. E and O.E.